[ Henry Howard, 4th Earl of Carnarvon, Conservative politician. ] Autograph Letter Signed ('Carnarvon') to an unnamed recipient (the Secretary of the British Academy? ), reaffirming his decision not to send pictures. On letterhead of The Coppice, Henley on Thames. 1 November 1879. On letterhead of Downing College, Cambridge. 1 February 1909. 2pp.,12mo. In good condition, lightly aged and worn. He has been informed by 'Mr. Hill of the Victoria & Albert Museum' that Harington has 'a Backstaff'. Adams has been 'looking out for one for some years' without success and would like to purchase Harington's if he has 'no use for it. 'I think Mr. Hill mentioned to you that I had a collection of old navigating instruments & he has very kindly been trying to find a backstaff for me'. He ends in the hope that Harington will 'excuse the zeal of the collector'. [ Alfred Brown, Scottish conchologist. ] Autograph Letter Signed to Dr. O. A. L. Morch of the Zoological Museum, Copenhagen, regarding a possible exchange of shells with a 'Danish Collector', containing long lists of bivalve and univalve specimens. 28 Burnbank Gardens, Glasgow, Scotland. 8 February 1873. Brown's collection of shells is now held by the Kelvingrove Museum in Glasgow. 4pp., 12mo. Bifolium. The text of the letter is on the verso of the last leaf and recto of the first, with the central two pages each carrying a neat list, in double column, the first of 'Bivalves' and the second of 'Univalves'. Pinned at the head of the first page of the letter is an advertisement cut from a newspaper, reading: 'A DANISH COLLECTOR OF SHELLS | wishes to exchange Fine Specimens of Land and Freshwater Shells from Denmark, with Specimens from England and other places. Refer to DR. O. A. L.
[ Joseph Warton, Poet Laureate. ] Autograph Receipt Signed ('Jos. Warton') of monies (presumably tuition fees) from Hugh Rogers. No place. 16 July 1767. On one side of 11 x 18.5 cm piece of paper. In good condition, lightly aged and creased. On reverse is small circular printed paper label of the Ray Rawlins Collection. Reads: 'July 16 1767 Received of Hugh Rogers Esqr the Above Sum in Full for His Son till Last Whitsuntide | by me | Jos. Warton'. Hugh Rogers of Helston, had a son, John, at Trinity, Oxford, presuambly tutored by Warton. [ Printed catalogue. ] The Denholm Collection of Autograph Letters and Ancient Curious Documents. + 74pp., 8vo. In good condition, aged and worn. In worn red cloth binding, with title in gilt on spine and front cover. A brief description of the more than 800 items in the collection, which was arranged in ten volumes. Occasional entries feature quotations. Of interest is Vol. 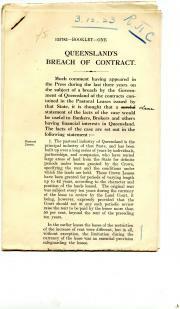 I, item 58: 'Winston Churchill, M.P., from Government House, Natal, in which he says: - | [five line quotation from the letter follows]'. See also vol.4, item 11: 'Napoleon I. Large (35 x 25 cm.) sumptuously-printed stitched pamphlet, in printed wraps. 16pp., with one additional collotype plate (stamped 'Specimen Colour Plate') and one tipped-in plate (of the binding), both coloured, and three full-page half-tone plates. Subscription form (The British Book Centre, Inc., New York), in red and black at rear. Aged and worn, with creasing to front cover. Includes three-page 'Commentary on a Unique Volume' by Winchester, and the first three pages of Wilson's text, two pages listing the contents, and specimen pages. Autograph Letter Signed ('L. Solon') from the French potter Louis Marc Emmanuel Solon of Minton's, Stoke on Trent, thanking the unnamed recipient and his friend 'Mr Bailey' for a parcel of circulars, and discussing his library of works on ceramics. 1 The Villas, Stoke on Trent, 8 July 1893. 4pp., 12mo. Bifolium. Good, on lightly-aged paper. Solon has been informed by their common friend 'Mr Bailey' that the recipient has 'been kind enough to gather the parcel of circulars issued at various time [sic] by your firm, and which reaches me this morning.' He is sending 'a small pamphlet of mine [...] as an inadequate acknowledgement of the trouble I have caused you'. He continues: 'Mr Bailey must have told you that all printed matter having reference to ceramics has a special interest to me. Correspondence about Gertrude Stein and related matters, and related photographs and other material. A. CD, "Finley Stein Holdings 2009". A catalogue of the Finley Stein Collection. B. Letters from Addison M. Metcalf, also a major Collector of Steiniana: Three Autograph Letters and Three Typed Letters Signed with full name, "Addison" only, or humorously ("Baron de Thou" etc) or is it "camply", to Finley, 6 Sept. 1957- [c.6 Nov. 1962 from postmark), with original envelopes, headed "Addison M. Metcalf's Collection of Gertrude Steiniana", total 7pp., 4to. On one side each of five 46 x 14.5 cm slips of paper. Good: slightly aged and with rusting to staple. 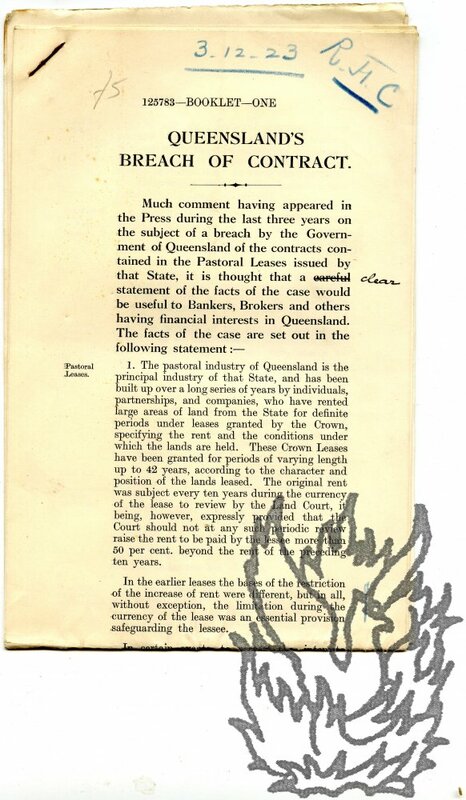 Begins 'Much comment having appeared in the Press during the last three years on the subject of a breach by the Government of Queensland of the contracts contained in the Pastoral Leases issued by that State, it is thought that a clear [altered from 'careful'] statement of the facts of the case would be useful to Bankers, Brokers and others having financial interests in Queensland. The facts of the case are set out in the following statement: - [...]'. Autograph Signature ('Abram: Hume') on fragment of frank. Paper dimensions roughly 2 x 5 cm. Good, although on discoloured paper, and mounted on piece of slightly larger discoloured paper docketed in pencil 'Sir Abm Hume'. Reads 'Free 274 | [signed] Abram: Hume'. Handbill headed 'Souvenir. Street Library Book Fund. ', consisting of a monologue entitled 'Lord Beaconsfield speaks before the curtain'. One one side of a piece of laid paper, 26.5 x 21 cms. Aged and creased, with chipping to extremities and staining on reverse from repair to one of two closed tears. Thirty-six lines, with facsimile of Housman's signature at foot. An appeal for 'money for the Library - your Library'. Somewhat poignant, considering the present neglected state of the British library service. '[...] The question is - do you want to give money to your Library? [...] But, for my own part, I ask - why, why Libraries? What are they for? What there do you read? Without date or place, but circa 1822. Dimensions of paper roughly five and a half inches by eight. Good, but on paper discoloured with age and with some glue-staining to reverse, which has not shown through. Docketed on reverse. An attractive example of Georgian calligraphy, within a thin black border.